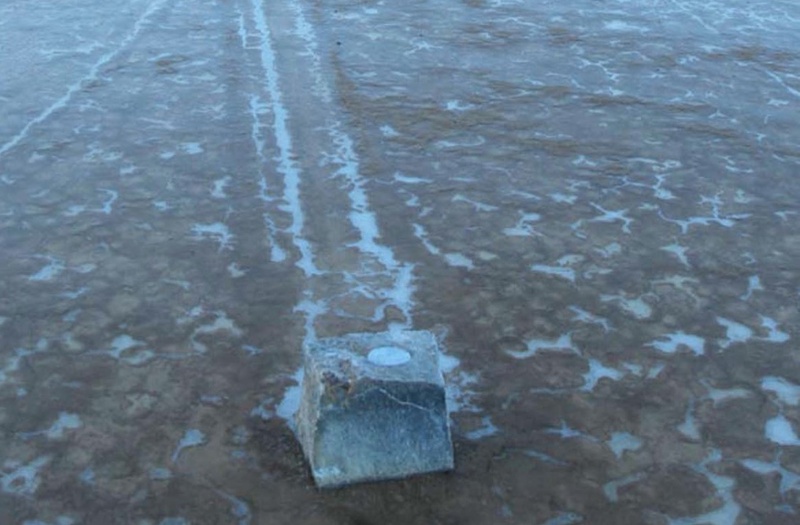 A dry lake in Death Valley, called Racetrack Playa, is home to the famous “sailing stones.” These large rocks, some of which weigh up to 700 pounds, leave behind long trails in the dirt, indicating that something — or someone — has been moving them. (See photo above.) But how? Conspiracy theorists and others with active imaginations have implicated aliens (of course), powerful magnetic fields, or just plain old magic as the culprit behind the mysterious phenomenon. More serious speculators suggested dust devils or a combination of rain and strong wind. These explanations, however, are wrong. Last year, Live Science (and several other outlets) reported that the mystery was solved. Researcher Ralph Lorenz had discovered that a rock with a ring of ice around it is buoyant (PDF). When placed in a shallow pool of water, Dr. Lorenz found that he could move the rock simply by blowing on it. Additionally, if there is sand at the bottom of the shallow pool, the rock scrapes out a visible path. But, as it turns out, this explanation isn’t quite right, either. Now, in a new paper published in PLoS ONE, Dr. Lorenz and a team of researchers led by Richard Norris and Brian Jackson have definitively demonstrated how the rocks move. They placed 15 GPS-equipped limestone rocks on Racetrack Playa. They also installed a weather station nearby, as well as several cameras. Then, the researchers monitored the rocks from late November 2013 to early February 2014. The rocks were located in a shallow pool of water that froze many of the nights. The next morning, when the temperature rose, the large sheet of ice would crack and pools of water would form. Large chunks of ice could then freely move around, dragging the rocks along with them, as the wind blew. In contrast to their hypothesis, the rocks did not become buoyant. Instead, the ice sheets — which were only a few millimeters thick, but several meters across — could exert a force large enough to move the rocks. Not only did the authors collect data on their GPS-equipped rocks, but their cameras also captured several indigenous rocks gliding about. The authors note that it would be difficult personally to watch the rocks in action due to their glacial pace. Also, the rocks move only on rare occasions; i.e., when a shallow pool of water is present along with freezing conditions and wind. Complicating matters for would-be enthusiasts is the fact that the ice would block anyone’s view of the trail, which is formed in the mud below. Only after the water is blown away by the wind do the trails become visible. Still, people who enjoy the sport of curling also may be inclined toward rock-watching. Now that the conditions under which the rocks can move are known, avid rock-watchers should plan a winter camping trip to Death Valley. Just be sure to pack some extra patience.